A RECENT publication written by an old Digger, who is now more than 90 years old, is fascinating for a number of reasons. The book is called The Boy from Bowen; diary of a Sandakan POW, and was written by Leslie Bunn Glover, a lieutenant in the 2/26th Infantry Battalion. He was captured after the fall of Singapore and sent with others to Sandakan in Borneo to build an airfield. The men were used as slave labourers. He was aged 20. The terror and misery of Sandakan has only surfaced in recent years, especially the story of the "death march" to Ranua in 1945, when so many exhausted men died or were killed by guards. Only six managed to escape, all Australians. As an officer, Glover did not experience the march but had to endure many of the hardships of the camp during the time he was there - and he tells his story graphically. Leslie Bunn Glover was a lieutenant in the 2/26th Infantry Battalion. More than half his book tells the story of his early life and it is possibly more fascinating even than his tales of war. It is also a great read for anyone wanting early history of Queensland towns like Bowen and of the importance of the railway to these areas. He was born in Townsville in 1921 to Lillian May Olsen and Leslie Bunn. He was illegitimate. His parents wished to marry but family pressure prevented it. His father came from a strict Catholic family while his mother's family were strict Norwegian Protestants, possibly originally Lutherans. His father was sent away to Sydney and never heard of again. The baby was accepted into the Olsen family, however his mother found it difficult to work and look after him. She therefore fostered him out with the Glover family, who lived in Bowen. They were distant relatives and young Leslie grew up to love this family dearly. It was the early days of the Great Depression, however, and times were hard. As well, he had to put up with the many slights from neighbourhood children regarding his birth. He learned to fight his own battles, and with determination he usually won. When he was about 10 years old, his mother decided he could return to her. She had married a railway worker named Jack Hansen and had two small sons. Leslie found life much more difficult and he did not like his stepfather. He also found his mother had a violent temper that, when aroused, would usually be aimed in his direction. He experienced terrible beatings from both parents and there were rarely any good things to compensate. He never received presents, even at Christmas, and if he wanted treats such as lollies he had to obtain them himself. He found he could sell bottles to get a few pence and any way of making money was grabbed. He realised that this money, though small, had to be hidden as his mother would take it from him for board. He became a fine sportsman, a boxer and cricketer. He got a job with the railway and when he was 16 joined the military cadets. At 18 he joined the militia and rose to become a corporal and instructor. When war was declared he became an instructor at the local Australian Imperial Force camp. 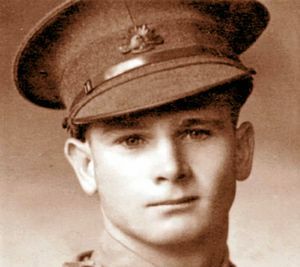 Just before his 20th birthday he enlisted in the AIF and shortly after was sent to an officer training camp.